Mickey Bushell believes the Paralympic Games will leave a big legacy and raise the profile of the sports involved. The 21-year-old from Telford won gold at the Games in the T53 100m in a time of 14.75 seconds. The wheelchair sprinter told BBC Sport: "Hopefully with the team doing so well it will have a big impact. "It should leave a big legacy, we pretty much smashed it. It should raise the profile of all the sports." London 2012 has been an exceptionally successful Paralympics for Great Britain, as they finished in third place in the medal table with 34 gold medals. However the true success can be measured in the enduring legacy the Games leaves for sport in the United Kingdom. Despite his youth, Bushell is already a very successful Paralympian, with his gold in the 100m following on from silver in the 200m four years ago in Beijing. He began competing as a teenager, racing at Telford athletics track under the tutelage of Keith Brennan, but admits that "racing didn't get really serious until I was 16 or 17". "We had a new head teacher who started a Saturday club and a Paralympian came along and asked me to get involved (in racing)," he added. This sparked Bushell's interest, but it was the arrival of Fred Periak as Bushell's coach that turned him into a Paralympic champion. Bushell was born on 8 June 1990 in Shrewsbury and grew up in Telford. He currently holds the world T53 100m record of 14.47s. He learned to walk on his hands at the age of three. He began racing after Paralympian Deborah Brennan was impressed by his speed while playing dodgeball at school. "In 2007 I moved coaches - I didn't think I was going to make Beijing, but he [Periak] changed a lot of technical things. He changed everything," said Bushell. Periak is a veteran of three Paralympic Games and helped Bushell achieve the consistent level of performance required to be a champion. 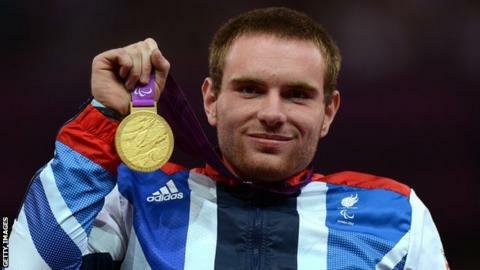 However without that initial opportunity he could not have become a Paralympic champion, and he believes the greatest legacy London 2012 can leave would be to ensure that such opportunities are open to as many people as possible, regardless of physical or mental impairment. "It is getting better," believes Bushell. "There have always been opportunities, there were when I was 11, but the inclusivity is better than it was 10 or 15 years ago." Stewart Lucas, chief executive of Interactive, an organisation which campaigns for disability equality in sport, agrees: "The opportunities are out there - people just have to go for them and not be afraid to use them. "The Paralympics is an elite event and will not be a 'magic wand'. Only 11-13% of disabled people can take part in a Paralympic sport and everyone has the right to be active and play sport. "The fact that they will be seen will open up the pathways and put it in the public consciousness." Bushell agrees that the impact of the Paralympics in the media will help leave a strong legacy: "Channel Four will make a huge difference, they have been absolutely magnificent. They are showcasing what everyone can do and it will be a boost to everyone." Across the United Kingdom only 6.1% of all adults with limiting disability or illness participate in sport or a physical activity, far less than the figures across the whole of the population. "The biggest obstacle [to disabled people being active] is society's view of people with impairments," commented Lucas. The sporting achievements of this summer's Paralympians have been hugely impressive, but if the Games in London succeed in altering society's perceptions for the better they will become still more valuable.